We are handicapping a game featuring Minnesota for the second time in a row. Congrats if you checked out our free pick for Minnesota vs Louisville yesterday. We called the cover and the win outright. Betting in the tournament isn’t about putting in as many games as possible. Its about picking winners, even if there is only one on the board for the entire day. Usually you can get two or three really strong picks per day during the NCAA tournament. For round two of the tournament, Michigan State is facing off against fellow Big Ten team Minnesota. The point spread currently has Michigan State -10 and the total is sitting at 142 points. At the time of writing this article, about 63% of the betting public has wagered on Minnesota plus the points. There is a lot of cross-data on these teams because they both play in the Big Ten. They play the same teams and they face each other at least once per year. In the last ten match-ups, over a 7 year period of time, Michigan State has gotten the best of Minnesota with a 7-3 straight up record and a 6-4 record ATS. 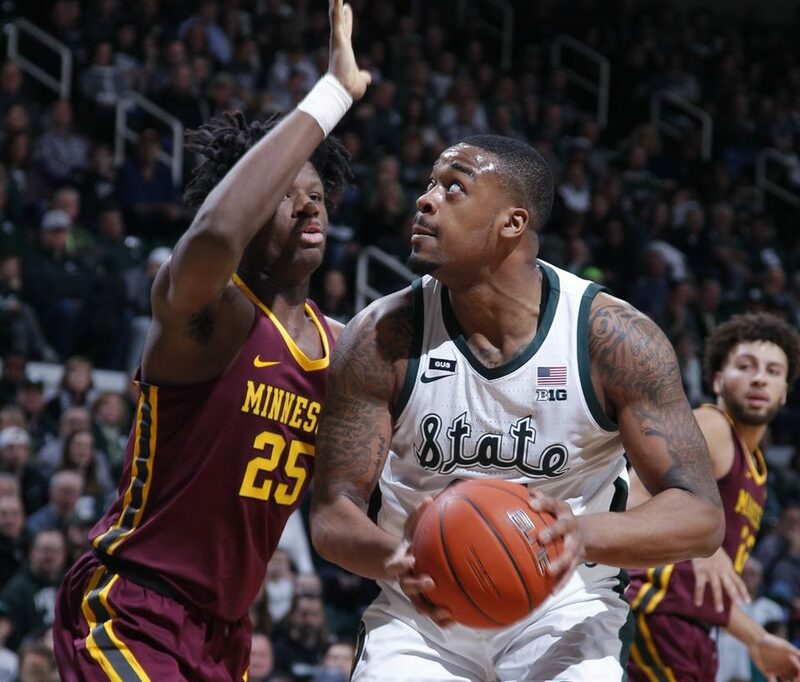 In their last meeting, which was six weeks ago, Michigan State pounded the Gophers into submission. The Spartans won easily and convincingly 79-55, covering the 13.5 point spread with no problem. Michigan scores 78 PPG and allows just 65 PPG. Cassius Winston is the Spartans number one scorer with 19 PPG. He also averages 7.6 assist per game. This Spartan team is very good. There is some controversy right now for what would be seen as a non-event 15 or 20 years ago. Head Coach Tom Izzo screamed at freshman forward Aaron Henry on the court after some mistakes were made by Henry. The team is fine but they may face some distraction from this event by the overly sensitive crybaby media. Minnesota came out played well against Louisville on Thursday. The game redeemed their self-image after they got crushed by Michigan in the Big Ten tournament. The Golden Gophers are riding high right now and think they have a good shot at beating Michigan State. Minnesota is 12-8 as an underdog. Minnesota is 4-3 in all neutral court games. Michigan State is also 4-3 in all neutral court games. Michigan State is 3-2 as neutral court favorite or pick. Michigan State came out and sputtered a bit against Bradley in the first round. They won by 11 points but did not cover the 18 point spread. They have some distractions with the yelling scandal. They have some kinks to work out. Minnesota is in a perfect position to give the Spartans some trouble. They are a conference foe. They know Sparty well. The Gophers are playing inspired basketball right now. They are 12-8 as an underdog and have no trouble playing on a neutral court. My money is on Minnesota plus the points. If you want to bet this pick check out the best online sportsbooks.